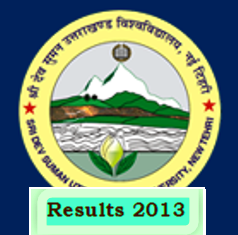 Sridev Suman Uttarakhand University is a newly University of Uttarakhand state, which provided UG and PG courses, the University was opened in last year. And the Headquarter of the Sridev Suman University is Badsahithol Tehri Garhwal. So from the last year University has conducted the private’s examination for the courses BA, B.Com, MA and M.Com 1st year. And the examination was held on May to June months of this year 2013. So as of now university has start to declares the results of given examinations. Now University has declared the M.Com 1st year private results. Now all the students will able to check their result of M.Com 1st year, so below I am giving a link to get your results online. Therefore click the given link and then a new window will be open so type your roll number on it and click to submit. Then you will get your results and marks details in it. Click here for M.Com 1st year results 2013. Click here for other results of University. For more results and exams details stay connected with our website or you may follow our updates by email subscription.